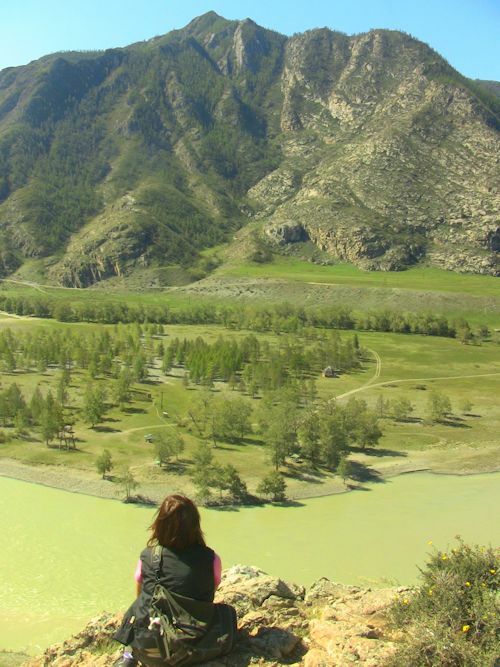 Greetings from Gorno-Altaisk, the capital city of the Altai Republic. We arrived here three days ago and it really feels like an emergence into the modern world. The streets are bustling with people living their city lives, destinations in mind, plans to meet and people to see. Gorno is a picturesque city, nestled between rolling green hills and lined with trees, changing with the arrival of autumn–the city will turn on the heat soon, warming the lives of the Siberians who endure a frigidly cold winter that lasts until May. It couldn’t have been a better time to arrive, as we got to celebrate the 84th birthday of the city with what seemed like the whole population last night. The city square (where the Snow Leopard Day Festival will be held in just one week) transformed into a stage filled with music, dance, light shows and fireworks. Children sat on shoulders, teenagers pushed through the crowd, old women watched in awe and we just soaked it all in. We are staying in the apartment of our translator, Natalya and her two young daughters. Much time is spent in humorous ways of communication: funny faces, humming and singing, and the very few words any of us know in our non-native tongues. Kids are always the most fun to communicate with when there is a lack of linguistic relation. Now that I’ve brought you up to speed with current life, let’s go back two weeks to where I last left you. We left Kosh-Agach after helping in the museum interviewing students, teachers, and local conservationists. This is a much deserved shout-out to Alice, SLC volunteer, who has been a great help throughout the trip, especially when it comes to entertaining the unusual amount of babies that have been present during our interviews. Without her, our film would be laden with the hiccups, screams, laughs, and chirps of Russian infants. And more notably, Alice has contributed countless valuable questions that will enrich and further our understanding of the development of SLC’s work in the Altai. Our journey back along the road that we came signified the turning of our trip toward the our ascent back to the States. Chiminsky Pass, the paved two-lane highway that cuts through the Altai mountains, is said to have been built on the bodies of the Russians who did the work, which means this highway was extremeley dangerous and difficult to build but now allows access into some of the most remote territories on earth. The thick clouds dispersed in front of a beautifully sunny day made for some of the most dramatic scenery as we twisted down in elevation to our next destination, Chui-Oozy, a small eco-tourism settlement. 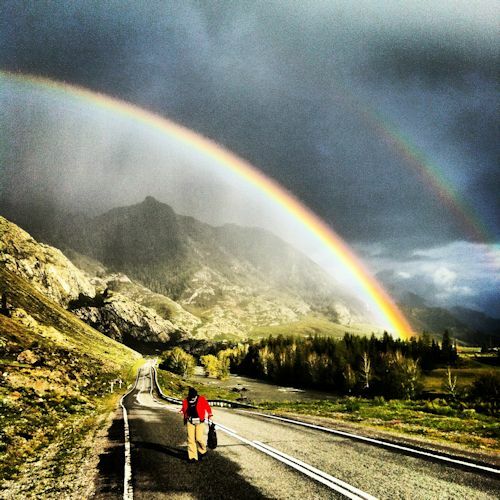 Before arriving, we witnessed the most breathtaking double rainbow in the existence of my little life. We all sat in awe, in the middle of the empty highway, staring, mouths open. We spent three days in Chui-Oozy, under the hospitality of Galina, a kind-eyed Altaian woman who let us interview her about tourism and her perspective of the current issues in the Altai and her hopes for the future. We also visited a petroglyph site that depicted life up to 15,000 years ago. Wild animals, people, and the heavens were all strewn about the rocks–such ancient history so tangible and present. I felt human, and a part of such a truly amazing history of human consciousness. We left Chui-Oozy, toward Inegen, a small settlement along a truly terrifying road that, as the locals told us, government officials won’t even travel. To travel this road was the best choice we could have made. Inegen is a magical place, as if from a fairytale you only fantasized about as a child. Set along the jade-green Khatun River and nestled in a lush, green valley between tall, protective mountains, Inegen probably only has 100-200 residents. It’s unique placement in the Argut River Valley, is a microclimate, perfectly abundant with healthy soil, sunshine and rain to have endless gardens. Each house is enveloped in green, thick gardens bursting with colorful flowers, perfectly delicious produce, and apple trees bearing the most crisp, sweet fruit. We stayed in Irbis Eco-lodge, a small settlement on the outskirts of town owned by Olga and Slava, a sweet couple who have lived in Inegen all of their lives. I was gleeful, admiring the craftsmenship of their wooden yurts and felt blessed to spend a week sleeping in these round homes that I have had the aspiration to build ever since I spent time in Mongolia. With a sweet little dog named Malush (little one, in Russian), a fuzzy, furry white goat, and a lone horse, we spent our days enjoying the simplicity and quietness of life in Inegen. Again, we were greeted by the town with a curiosity that turned in to honest hospitality. And we met people passionate about saving the snow leopard and protecting the land that these people share with the wild animals of the Altai. We visited the school, visited peoples’ homes and shared countless cups of tea, homemade bread and jams, preserved vegetables and various salads. It was hard to leave this place as this is the life I strive to live: simple, honoring nature and our place in the family of things, harvesting food grown in the yard, building the home I live in. We left as dawn broke on Friday and as our trusty Russian utility van left the last of the bumpy, unpaved, dirt roads to be traveled on this trip, I felt a wave of nostalgia (already!) for the unpaved life, the gritty, the unpredictable, the undeveloped–a life that I revel in each time I leave the comfort of my own.